It might sound like a cliché, but prevention is truly better than cure. We all should go the extra mile in taking good care of our health by maintaining a healthy diet and incorporating exercise in our daily routine. One of the things you can do to maintain a healthy body is to do juicing. Juicing is a kind of way of consuming plant foods by extracting their fluids and turning them into a drink. Wheatgrass, for instance, is a great plant for juicing because of its plethora of health benefits. There are different juicers specifically for this plant out there. We checked out the different wheatgrass juicers out there to find the ones that are worth recommending. Read on to know what products are great for you. Wheatgrass is one of the best ingredients for boosting your health. It contains plenty of antioxidants and nutrients that can significantly enhance your overall health. Wheatgrass, also known as “triticum aestivum”, is a gluten-free glass that is completely edible. It can come in multiple forms including juice, powder, capsules, pills, and tablets. Although all forms of wheatgrass can work very well for boosting your health, the best way to take this superfood is by juicing it. The main reason why you need a juicer for wheatgrass is so your body can digest and absorb its nutrients much faster than any other form. Ingesting wheatgrass without altering its natural form is the best way to do so. If you have access to fresh wheatgrass, do not hesitate to get a juicer, because doing so will allow you to ingest this superfood in the best possible way. So now that you know why you should get a juicer for your wheatgrass, let us now discuss the different kinds of juicers available in the market today. The centrifugal juicer is the kind of juicer that is ideal for fruits and hard vegetables. It uses the power of centrifugal force to get the juices out of ingredients like carrots, celery, oranges, and apples. Centrifugal juicers also tend to be quite cheap. They don’t cost as much as their counterparts and they are also easier to use. However, I don’t really recommend using centrifugal juicers for leafy green and fibrous ingredients since its high-speed rotating blades do not really do a good job at extracting the juices from such ingredients. When used on leafy greens and fibrous ingredients, you can still get a healthy amount of juice, but it won’t be as healthy as when you get it from a masticating juicer because it becomes oxidized and foamy because of the high-speed rotating blades. Another downside to centrifugal juicers is that they can noisy to use, which is not ideal for early morning juicing if there are still people asleep in your household. The other kind of juicer you will be able to find in the market today is the masticating juicer. Unlike the centrifugal juicer, a masticating juicer is the best choice for extracting juice from leafy greens and fibrous ingredients. What makes a masticating ﻿﻿juicer an effective tool for juicing leafy greens and fibrous fruits is its mechanisms that are similar to the way humans chew food. Unlike centrifugal juicers, a masticating juicer doesn’t comes with high-speed rotating blades that produce heat that leads to the oxidation of the ingredients. This means that you will be able to get healthier extracts with more nutrients. Another great thing about masticating juicers is that they are able to produce juice with less pulp. Simply put, a masticating juicer can get the most juice out of an ingredient whether it is a hard vegetable, soft and pulpy fruit, or a fibrous ingredient. However, masticating juicer also come with their fair share of shortcomings. For one, they are a whole lot more expensive than centrifugal juicers. Maybe it’s because they can yield healthier juices. Another downside to a masticating juicer is that it is much slower at juicing than the centrifugal juicer. So, if you are looking for a juicer that you can rely on when you’re in a rush, this kind of juicer may not be able to meet your needs. 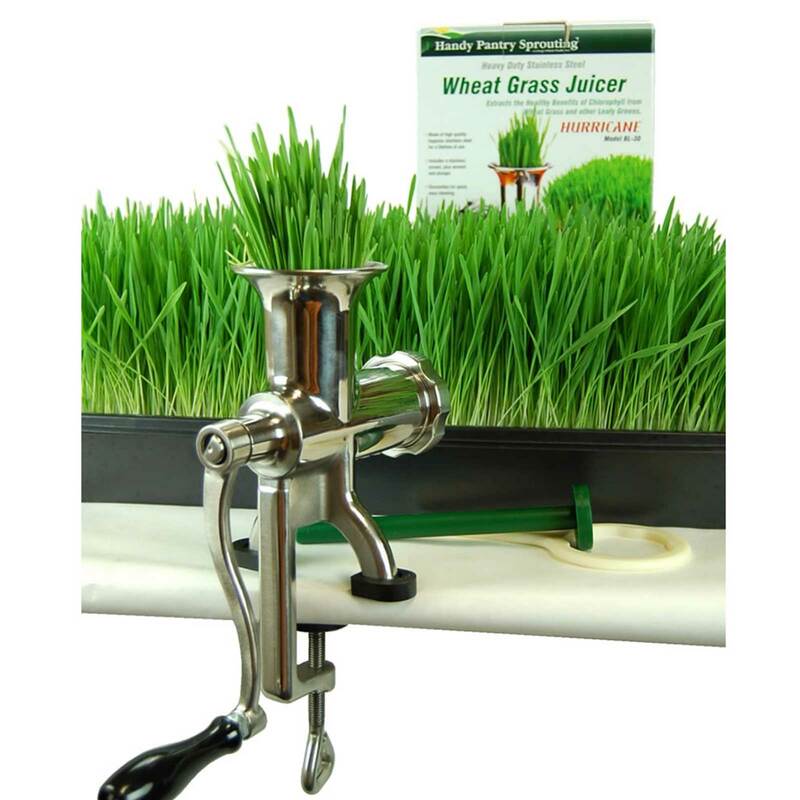 To ensure that you will get a reliable product that you will enjoy using, try to go over these following factors that you should never forget to consider before you purchase a wheatgrass juicer. When it comes to purchasing a juicer for beginners, try to avoid going with one that comes with all the bells and whistles. A juicing newbie might only get overwhelmed with the plethora of features that come with advanced juicers. Instead, try to go with a practical juicer that wouldn’t cause you to get impatient or to get headaches whenever you use it. Try to look for a juicer with a functional design. Even though you may only want to use it for juicing wheatgrass, you may also want to get a juicer that can do a great job at juicing other ingredients as well. After all, juicers can cost you hundreds of dollars, it would be wise to go with one that you can maximize through versatility of use. This may mean that you should go with a juicer that comes with plenty of parts for added versatility. However, you must take note that a juicer that comes with multiple parts can be more difficult to clean and maintain in the long run. Another important feature that is related to design is the size of the juicer’s feeding tube. Try to choose a juicer that comes with a medium-sized feeding tube so that you would be able to put in large ingredients without having to put much effort into cutting it up into smaller pieces. A larger feeding tube also allows for less clogging. When choosing a juicer based on its power capability, you first have to consider your lifestyle and personal needs. Simply put, if you are the kind of person who’s always on a rush, try to choose a juicer that comes with a powerful motor since it will be able to produce juices really quickly. This may mean going with a centrifugal juicer instead of a masticating juicer. Do take note that in terms of power, the more powerful and the faster your juicer is, the less healthy your juices will be. This slow masticating juicer is a great choice for getting the healthy juices out of wheatgrass because of its masticating mechanics that is able to let it yield a lot of vitamins, minerals, enzymes, and other properties that cannot be fully extracted with a centrifugal juicer. This masticating juicer does an effective job at extracting the healthy juices from an ingredient because of its low speed function that allows for less foam, minimal to no clogging, no heat build-up, or any other factor that can cause oxidation of your ingredients. Another great thing about this juicer is that it comes with a reverse function that you can rely on if it ever clogs up. Since it comes with such a feature, it’s also very easy to clean and maintain. It’s even dishwasher-safe and it comes with an automatic pulp-ejection feature to aid you with cleaning. Perhaps the only downside to this juicer is that it takes time juicing your food. It is not the best choice for you if you plan to get fresh juice during early mornings where you need to rush off to work. This masticating juicer is certainly a machine that will help you get nutritious juices that can last for up to 3 days because it will not be altered to become something that is too far from the ingredients’ natural state. It is not as fast as others but since you will be able to create fresh juice that has a shelf-life of 3 days with this machine, you can easily stock up on fresh juice in your fridge so that you can just take a glass or bottle when you’re on the go. Another great thing about this machine is that unlike other juicers that contributes to the oxidization of juices, this one does no such thing because it has a very low speed, it doesn’t heat up too much, and it doesn’t produce foamy drinks. What’s more is that it even operates very quietly. This means that you can use it really early in the morning without having to worry about disturbing people who are still asleep. Lastly, you will not encounter any issues with maintaining and cleaning this machine. It comes with an automatic pulp-ejection function, it doesn't clog, and it even comes with a 15-year warranty that you can rely on if any issues arise. 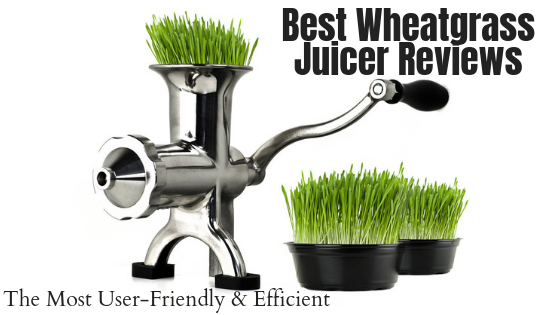 If you are looking for a practical piece of equipment that you can rely on to get fresh wheatgrass juice, then this manual wheatgrass juicer may be the best choice for you. What’s great about this piece is that it takes away all the unnecessary bells and whistles out of the machine and it only leaves the essentials that you need to extract the nutrients out of wheatgrass, or other fibrous ingredients, in its simplest form. Another great thing about this product is that it doesn’t require as much counter space or storage space like electric juicers do. It also helps save your electricity costs since it doesn’t require any electricity to work at all. It’s also a product that’s quite easy to clean and maintain. It’s made out of heavy-duty stainless steel, it is completely dishwasher safe, and it is completely rust-proof. You can also rely on a nice 5-year warranty if any issues ever arise. Perhaps the only downside to this machine is that it requires a little elbow grease for you to get a glass full of wheatgrass juice. It’s also not the best machine to use if you plan on creating large batches of wheatgrass juice. This centrifugal juice extractor from Breville is a great juicer that you can certainly rely on if you’re the kind of person who’s always on the go. With this juicer at your disposal, you will be able to create fresh and nutritious juices within a few seconds. What I like about this juicer is that it comes with a rather large feeding tube that will allow you to juice large chunks of ingredients without having to put in too much effort into cutting up your ingredients. Another great thing about this juicer is that it is very easy to clean and maintain. It comes with completely dishwasher-safe parts and it is supported by a 1-year warranty and great after-market service that you can always rely on if any issues ever arise. 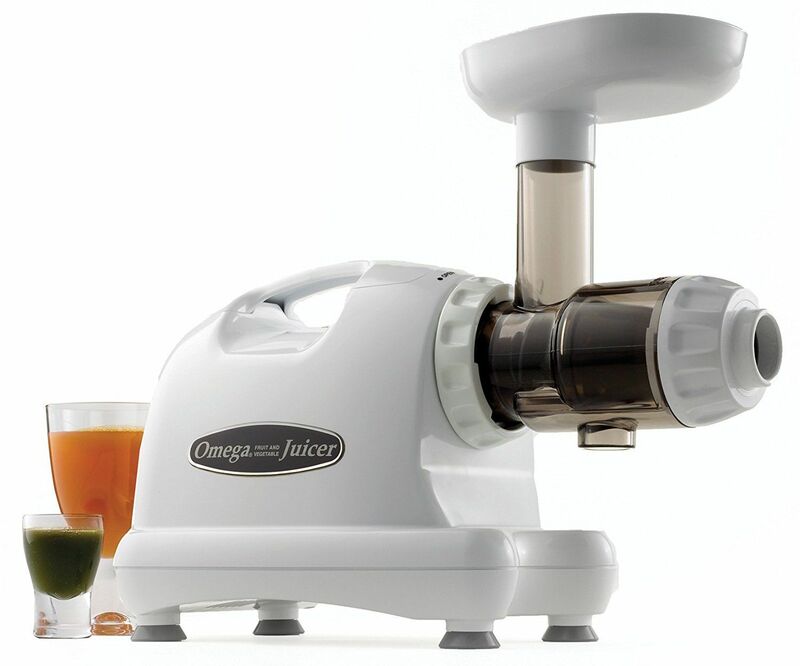 The last one in this list is another masticating juicer from Omega. The J8004 is another masticating juicer that you can rely on to get perfectly healthy juices without having to worry about lost nutrients because of oxidation. What’s great about this juicer is that it comes with a single-gear commercial motor that reduces the amount of heat buildup when in use. Because of this, this machine is able to produce extremely nutritious juices that can help you boost your overall health. A couple more ideal things about this juicer is that it does not produce foamy juice, it doesn’t clog, it comes with a very handy pulp-ejection feature, and it is very easy to assemble and disassemble. Being so, it has become a machine that is very easy to clean and maintain over time. 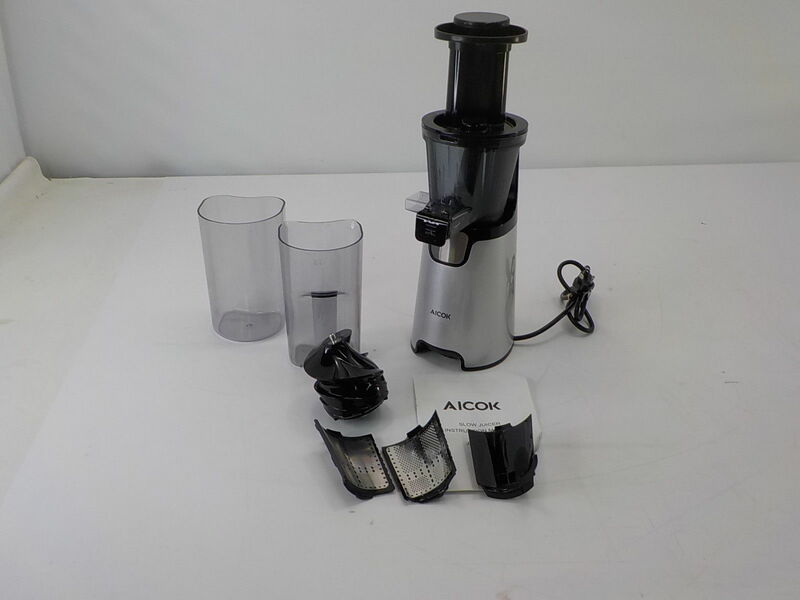 If you are on a budget, get the Aicok Slow Masticating Juicer Extractor. It is the cheapest one, but it doesn’t lag behind when it comes to quality construction and helpful features. 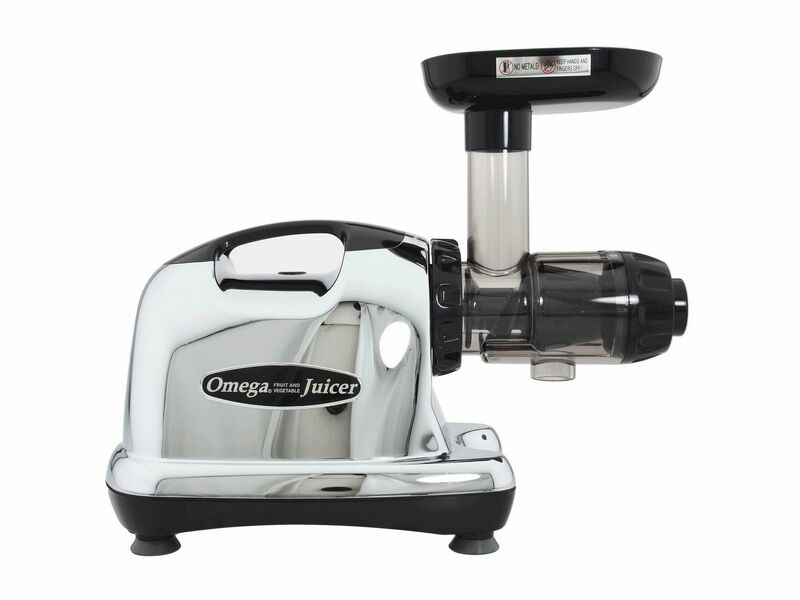 The Omega J8006 Nutrition Center Juicer takes pride in producing juices that can last longer when stored. Although not as fast in producing juices, it effectively preserves nutrients, thereby allowing the juice to be stored for a longer period of time. Get this if you are a meal prepper or you prefer making juices in advance. Looking for a manual juicer? Get the Handy Pantry HJ Hurricane Stainless Steel Manual Wheatgrass Juicer. It doesn’t require electricity to use, ideal for people who want to have a juicer that they can bring anywhere. Want something that can create juices in just a few seconds? 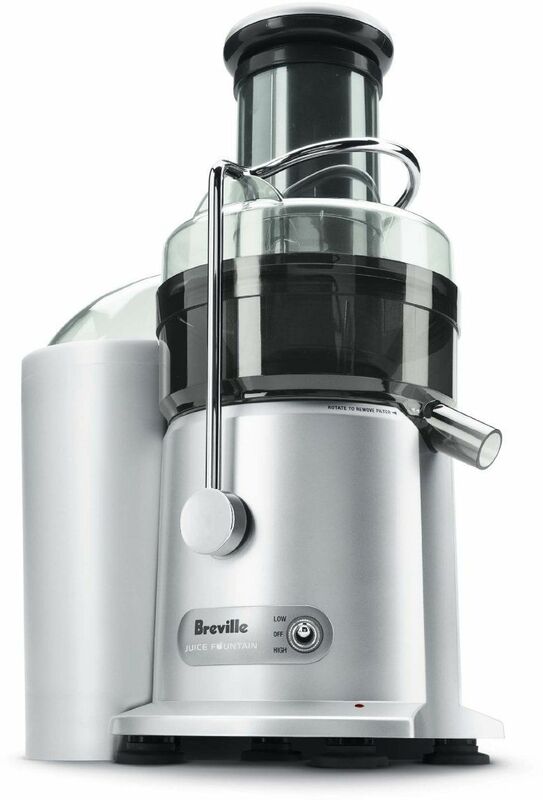 The Breville JE98XL Juice Fountain Plus 850-Watt Juice Extractor is the best choice for you. It is a fast machine that can give you a batch of juice without waiting for a long time. The Omega J8004 Nutrition Center Commercial Masticating Juicer is the more ideal option if you are looking for something that has a high juice yield. It can be pricier, but its benefits are worth it. We've weighed up all the pros and cons and decided that, overall, the best wheatgrass juicer has to be the Breville JE98XL for its excellent performance and affordable price. Now it’s time to decide what to get. With these choices, you definitely can’t go wrong. Make sure you also visit our homepage for more recommendations on kitchen products to buy. Read our buying guide and product reviews to be more informed.